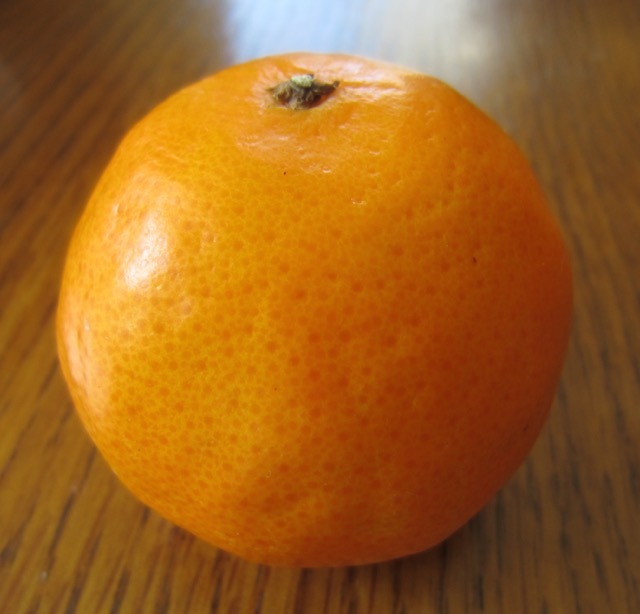 Also referred to as Moroccan clementine, Clementines are mostly imported from North Africa and Spain. Clementine is a result of accidental hybridization, between a mandarin and a sweet orange. The first fruit was discovered by Brother Clement Rodeir (the fruit is named after him), in the garden of his orphanage in Misserghin, Algeria. Clementines are not always easy to distinguish from other varieties of Mandarin oranges. Other sources say it originated in china, and is nearly identical to Canton mandarin in Guangxi and Guadong Provinces in China. They are small, easy to peel, like tangerine, and almost always seedless (unfertilized). Due to this they are sometimes referred to as seedless tangerines. The flesh is deep orange with a smooth glossy appearance, they have 7-14 segments with a very thin membrane. They are juicy and sweet and less acidic than the common orange. They are sold in net bags or in small wooded cardboard containers. Clemenules or nules: high quality, popular, seedless, easy to peel with a pleasing sweet flavour. It’s a mutation of Spanish Fina variety and is most widely cultivated in Spain and California. Nadorcott: a patented late season seedless variety, grown in isolation. It is more red-orange in colour with a thinner peel, flavour less sweet, more tart and bitter then clemenules. Patent filed in 1997.